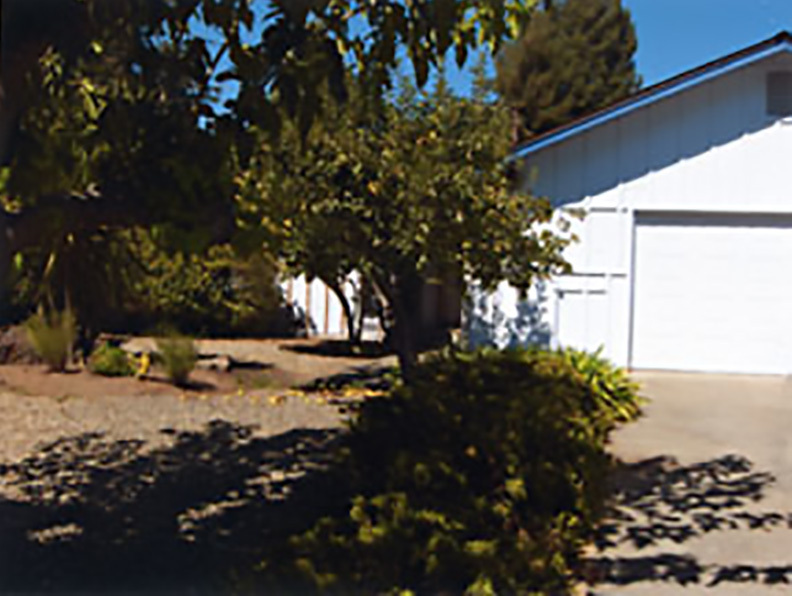 This 30-year-old Sonoma ranch home was looking for a face lift. 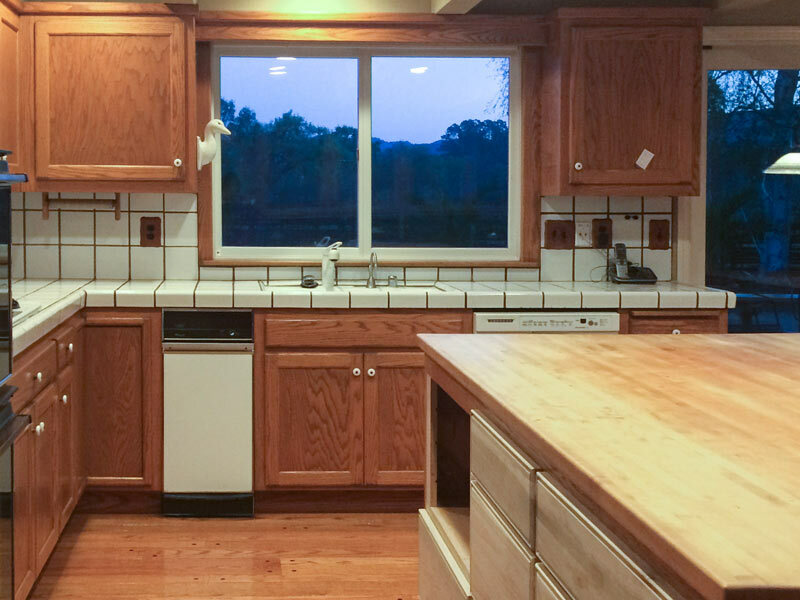 Accent on Design created a lighter look with new cabinets, counter tops, and updated appliances. This kitchen’s distinctive look was created using custom built antique white cabinets. black honed quartz counter tops, and old Chicago brick tile. 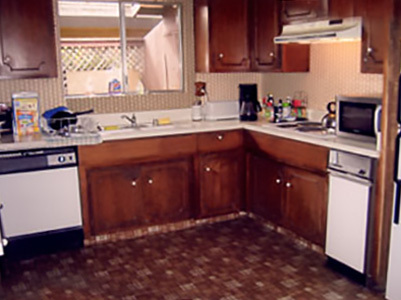 Marty used the existing 7-foot-long island, using the original butcher block counter top. She added new drawers and cabinet doors painted in black to match the quartz counter top to tie it all together. This property located on the Napa River in Napa California was originally a tract home used as a rental. When new owners purchased it, they hired Accent on Design to give the property a complete upgrade – indoors and out. Marty created a country French look for the kitchen with textured walls, new cabinets, quartz counter tops, and tumbled marble splashback tiles. Upgraded stainless steel appliances were installed along with hickory hard wood plank flooring. The devil is in the detail for this renovated Sonoma kitchen design. Marty re-purposed the center island by adding fluted posts and a granite looking quartz counter top. 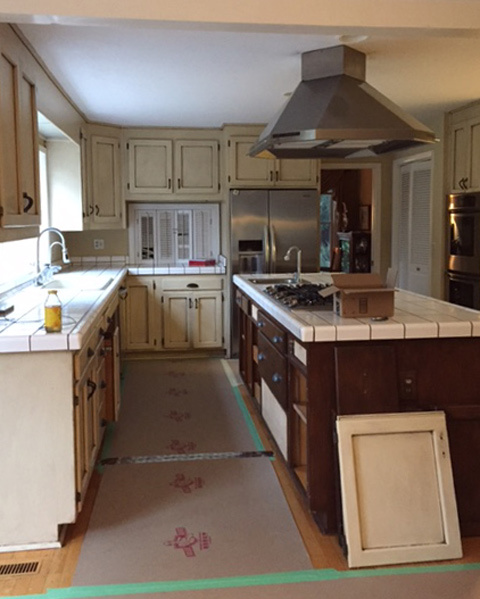 She added new hardware and paint to island doors and drawers. Crown molding was added for a touch of elegance to the ceiling trim and main counter tops were updated with solid colored stone quartz. New stainless-steel appliances were installed along with a new kitchen fan hood designed for style and efficiency. Mosaic glass tile was added as a backsplash accent. Hardwood floors were re-stained for a contemporary look. 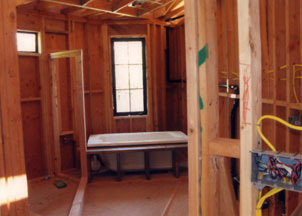 The use of a glass block shower wall lightened and brightened this Napa bathroom remodel. A French country look was completed with quartz counter tops, rectangle sinks, and travertine tile for the floor, tub and backsplash. A sunken spa tub and new cabinets finished the picture. When Marty began this project, there was no existing landscape in place. The transformation was completed using gravel borders to accent the fruit trees that were present on the property and added a lawn. Fencing, rock flowers, and a raised bed in the center of the yard tied it all together.